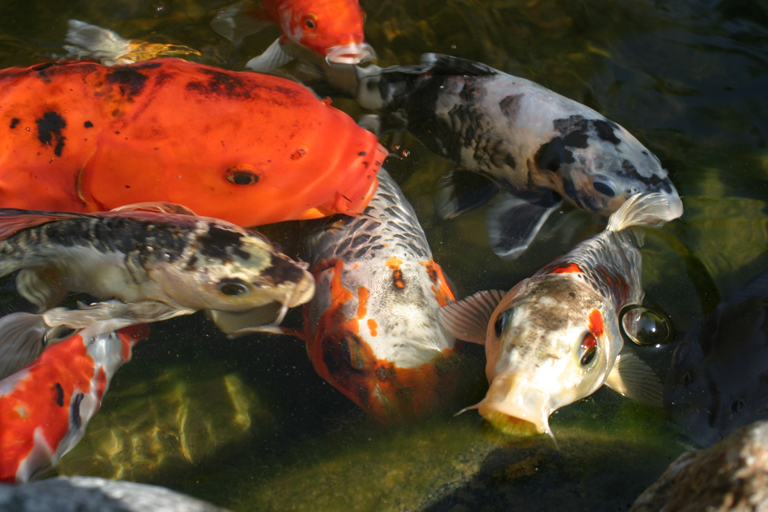 Despite what your animal-loving instincts might tell you, your koi and goldfish will not starve if you stop feeding them during the winter. In fact, you’re giving them a better chance of avoiding health issues this way. When the water temperature drops below 55°F the metabolism of the fish slows way down. Koi, and goldfish, can’t process most foods they eat during this time and could develop, potentially fatal, digestive issues if they continue to ingest protein rich fish food. Any uneaten food left in the water will be harmful to the fish as it diminishes the water quality. Fish naturally store up a supply of energy that they use to stay alive and healthy during this time of dormancy. You can be confident of this… your fish will not starve if you stop feeding them this winter! For those of you who just can’t fathom not feeding your beloved pets, try Cheerios. This breakfast favorite consists mainly of wheat and oat which are much easier for fish to digest during the winter. Crush up a few pieces and toss it in. If they aren’t interested, then remove the food and wait for the Spring. You can start feeding them once the water get’s above 55°F.